Series 5 WaterFlex WF2s Wet & Dry shaver with protection cap, black. Braun WaterFlex Wet&Dry shaver. For an unbeatably close*, smooth feeling. With contour-adaptive swivel head for excellent adaption. The OptiBlade is the most advanced foil from Braun. Its unique shape allows to capture more hair and cut them deeper than ever before. Braun has over 50 years of foil evolution experience culminating in our unique OptiBlade. Triple action cutting system. Amazingly close shave. Surrounding the middle trimmer, the two OptiBlades are the most advanced foil design from Braun. With their special geometry and dimensions they catch more hair and cut them deeper. Specially designed to work with foam and gel. The skin experience of shaving with water, foam or gel. The thoroughness and convenience of Braun. Of course the Braun WaterFlex is 100% waterproof (certified to IPX7 standard). So you can comfortably use it in the shower and easily clean it under running water. Powerful rechargeable Li-Ion battery with no memory effect. WaterFlex shavers use a powerful 3,6V Li-Ion Battery with no memory effect. Full charge in 1 hour only  45 minutes cordless shaving. 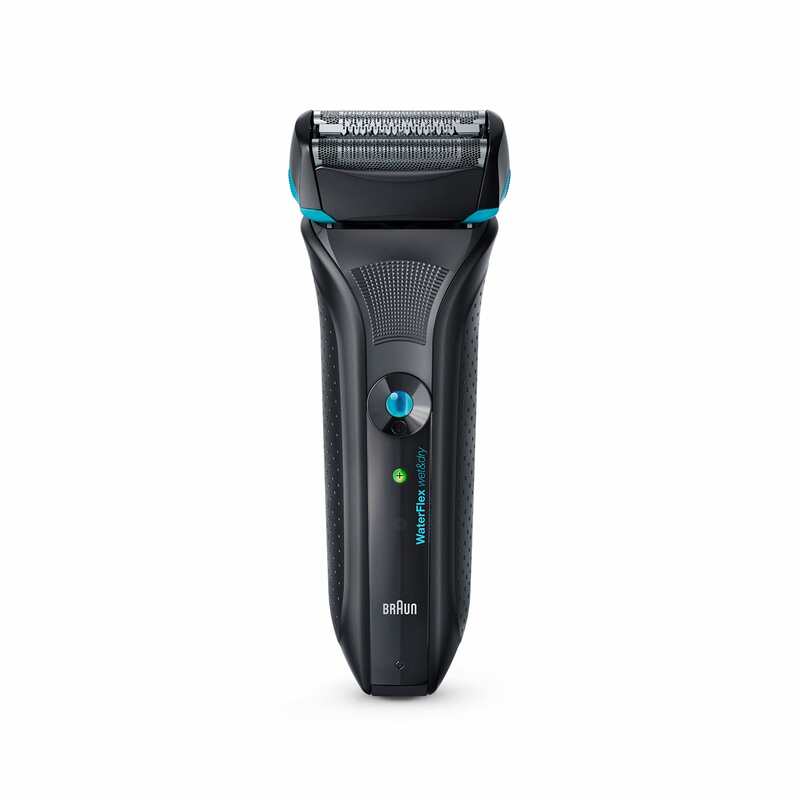 1 hour charging time gives you up to 45 minutes cordless shaving. A quick 5 minutes charge is sufficient for 1 cordless shave. Slide out the precise long hair trimmer for accurate moustache and sideburn shaping. 2-stage LED display for battery status. WaterFlex features a LED display indicating battery status. Braun WaterFlex Wet&Dry shaver. For an unbeatably close<code>&ast;</code>, smooth feeling. With contour-adaptive swivel head for excellent adaption. <br> <br> <code>&ast;</code>Tested against leading competitive products in the same class.